Chapter 5 – William Clark, Jr.
Hannah was the daughter of George and Mary Marcus, who had arrived in Natal on the “Aliwal”, in 1849, as Byrne settlers. George Marcus, who had experience of sugar cane farming in Jamaica, was granted a farm at Tongaat. According to May Eales, his grand-daughter, it was George Marcus – not Edmund Morewood – who manufactured the first sugar in Natal.3’ However, it is clear that Morewood was the first to cultivate sugar cane on a commercial basis. The original Marcus farm in Tongaat is now incorporated in the estates of the Tongaat Sugar Company. May Eales states that the farm was designated as the “Marcus Field”, that it adjoined a “Marcus siding”, included a “Marcus Hill”, and extended to “the main road where the Indian barracks are at present”. George and Hannah had eleven children, namely Thomas William (born January 8,1873), Mary Jane (May) (born August 23, 1875), Christopher George (born December 25, 1876), George Henry (born June 23, 1879), Edith Hannah (born September 4, 1881), Peter Joseph (born March 26, 1884), Sarah Ann (born June 25, 1885, and died in infancy), Francis Albert (born March 5, 1887), Emily Maud (born December 7, 1889), Leonard James (born June 2, 1892), and Muriel Alice (born March 1, 1896). George lived on part of the land acquired in the mid 1860’s by his father, William. He was a builder, and built and lived in a large double storey house, on the south-west corner of York Avenue and Bulwer Road, until his death on August 16, 1920. This was apparently one of the first double storey buildings to be constructed in that part of the Berea.4’ According to Myrtle Deetlifs, the house started off as a single storey cottage, and George added the second floor to cater for his growing family. She says that the rear of the house faced Bulwer Road, and that after Hannah’s death it was sold and turned into flats. George also built and owned two semi-detached dwellings and a cottage in Clark Road. These he bequeathed to his children May, Thomas, George, Christopher and Peter.5’ The cottage was to go to May, with the other heirs being entitled to choose from the semi-detached dwelling units, in order of age, after Hannah’s death. In terms of George’s will Muriel also received property – a piece of ground, between York Avenue and George and Hannah’s dwelling on Bulwer Road, with a frontage of 37 feet onto Bulwer Road. George’s nephew, attorney W. T. Clark,6’ was directed by the will to do the necessary conveyancing. In terms of George’s will, Hannah was entitled to the income from the properties until her death. Tom predeceased Hannah, and on her death a dispute arose in the family regarding whether Tom’s children should be entitled to exercise what would have been their father’s right of first choice among the four dwelling units in Clark Road. The dispute could not be resolved within the family, and it ended up being litigated in the Durban Supreme Court. The court found that Tom’s descendants had the right to exercise their father’s first choice of the dwellings. One of those descendants was Myrtle Deetlifs. She recalls that No. 133 Clark Road was the choice of the family. However Tom’s children never actually lived in that house, preferring to remain in their existing house in York Avenue. George’s four semi-detached dwellings still stand, and they bear street numbers 125,127, 131 and 133. George Clark was a devout Christian. In fact, George and Hannah had met through their attendance at the Wesleyan Church, in West Street, where Hannah “became under some deeply religious influences at revival services”.7 George and Hannah remained lifelong and dedicated members of that church. The plaques erected to their memory, on the fifth floor of the present Durban Central Methodist Church at the corner of Smith and Aliwal Streets, bear testimony to this fact. It was George’s practice to conduct his own service in his home every Sunday at 7 a.m. Attendance was compulsory for the members of his extended family who lived in or close to York Avenue, i.e. the Tom Clark’s, the Frank Clark’s, the Burden’s and the Eales’: according to Myrtle Deetlifs, if the grandchildren were not present they “used to get it”. George conducted the service from his own pulpit! From all accounts Hannah Clark was a remarkable woman. Her obituary concludes with the words “and perhaps among those who will miss her most are the 25 grandchildren who were constantly in and out of the old house, and whom she was never tired of serving with the good things of life”. Myrtle Deetlifs confirms the correctness of this conclusion, and says that “granny Clark” virtually took over the role of mother following the death of her own mother when Myrtle was only thirteen years old. Hannah used to bake scones every day, and the grandchildren called on her daily after school, where they were treated to scones,and bananas. It was Hannah’s habit to give all of the grandchildren a “tickey”8 for church collection, and seven pence for general spending money. The latter amount was traditionally expended on bus fare. (a penny each way), ice cream (one penny) and “bioscope” (four pence). At her funeral the grandchildren were all dressed in black, and constituted the chief mourners. From photographs of George, he appears to have very much enjoyed the role of the patriarch. 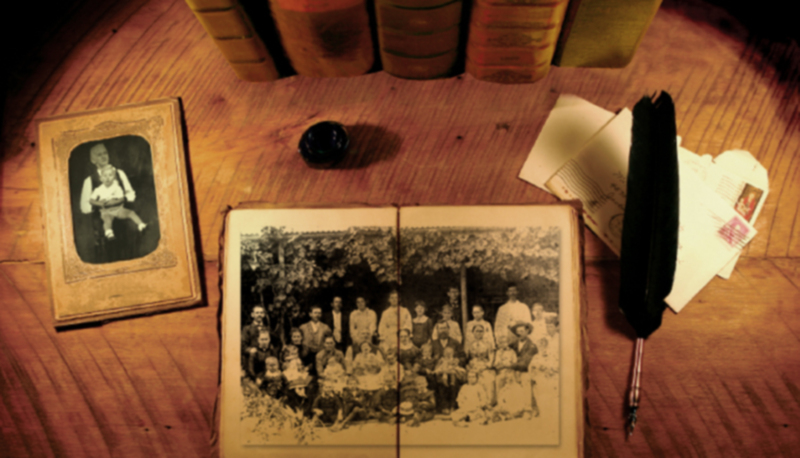 Although those photographs probably depict the style of photography of those days, they suggest that he was the proud head of his large family. Myrtle Deetlifs says that he was known in the area as “good old George”, because of his kindness and courtesy. She says that George had the habit of putting out on the pavement whatever naartjies, oranges or other-fruit he had from his garden which were in excess of his family’s needs. Passers-by were entitled to take this fruit at their discretion. George’s eldest child, Thomas William (“Tom”), married Marion McConnell (born 1875, died May 4, 1917) almost literally the girl next door: her family lived next door to William Clark Senior in Brand Road, on the Davenport Road side. There were seven children of this marriage: Arthur William (born February 26, 1901), Edith Marion (born November 30, 1902), Myrtle Alicia (born November 24, 1904), Milton Thomas (born April 9, 1906), George Norman (born October 27, 1907), Elaine Margaret (born October 24, 1909) and Thelma Doris Alexandra (born December 21, 1911). Tom was a bricklayer by trade, and one of the contracts on which he worked was the construction of.the Durban City Hall. He later joined the Transport Department as a tram and bus driver. Tom and his family lived at 24 York Avenue, in the fifth house from Bulwer Road, on the Davenport Road side of the street. Tom died on June 21, 1923. Mary Jane (“May”) married Alfred Eales. They lived at 20 York Avenue – next door to Tom Clark, on the Bulwer Road side. Alf Eales was employed by the South African Railways, and later by Robertson and Cubitt. He was an enthusiastic part-time soldier with the Durban Light Infantry for 32 years, where he rose to the rank of Regimental Sergeant Major. Amongst the items on display in the Local History Museum, Durban, is a letter written by Alf Eales to May while he was away on active service during the Bambata Rebellion, in 1906. May was a great Royalist, according to Myrtle Deetlifs. May and Alf had one child, Muriel Emily Wilhelmina Eales (“Bobby” or “Bobbin”). She worked as a librarian at the Railway Institute, in Pine Street, and then at the University of Natal in both the Howard College and City Building libraries. The Clark family owes a significant debt of gratitude to Bobbin Eales, since historical notes and documents which she lodged with the Killie Campbell Museum and Local History Museum were among the first sources used in gathering the information for this booklet. Christopher married Harriet Ewing, a widow. He lived in Clark Road, in the second house from the corner of York Avenue, on the Brand Road side. Christopher was also a bricklayer by trade, and was employed by the South African Railways. He died on June 3, 1951, at the age of 75 years. Christopher had one child, a daughter, Flora. Flora Clark married three times, becoming, respectively, Mrs. Hughes, Mrs. Bovey, and Mrs. McGhee. 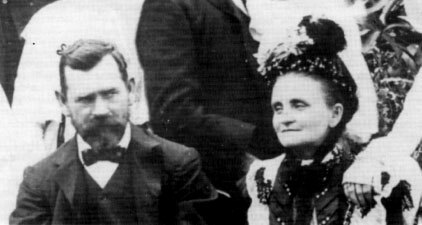 George Henry married Alice Jones. He was a hotelier, and at one time owned the Hotel St George in Pietermaritzburg. George had three children, Bernard George (born 1910), Wilfred Sanders (born December 19, 1912), and Clive Harcourt (born 1922). Bernard died at the age of 21, as the result of an illness. Clive was a South African Air Force navigator in World War Two, and was lost in action – his aircraft never returned from operations over Crete in 1944. Wilfred played rugby for Natal from 1933 to 1936.9 He distinguished himself in the South African Air Force and the Royal Air Force (on secondment) during World War Two, seeing service in the Atlantic (mainly anti-submarine patrols), North Africa and in Europe. Wilf was one of the youngest Lieutenant Colonels in the Air Force, and commanded both the 31st and 15th Squadrons of the S.A.A.F. He married Irene May Cameron, whom he met on Malta while she was working in the fighter control plotting room, in May 1943. Wilf was a past Chairman of the Air Force Club in Durban. He died on March 11, 1980. Edith Hannah married William Burden. The wedding photograph proved to be a most useful catalyst for obtaining material for this chapter, and it is published in the booklet. 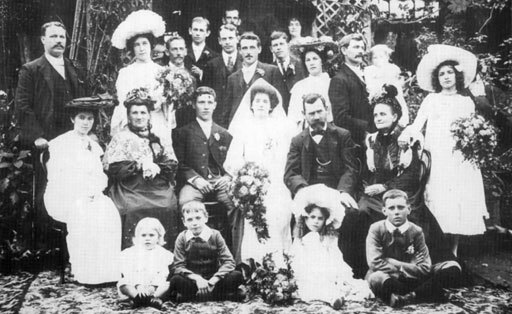 Of that marriage three children were born: George Lewis Burden, William Lawrence Burden and Edith Ester Burden. Edith’s sister, and George and Hannah’s third daughter, was Emily Maud. She married Frank Smith. Of that marriage there was one child, Melville, who died at the age of 10 years. Emily subsequently married George Adendorff. Peter Joseph married Hilda Sloan. They had three children: Marjory, Ray and Noelle. Peter served with the South African forces in the First World War, and was injured while on active service in France. Myrtle Deetlifs says that his memory suffered as a result of the injuries which he sustained. His military service is commemorated by a plaque in the foyer of the Central Methodist Church in Durban. Peter lived and worked in Howick for a number of years, being employed by the Sarmcol Rubber Factory there. Peter died in March 1977. His son Raymond Bostock Clark served in World War Two, in an artillery regiment attached to the Sixth South African Division. Francis Albert (“Frank”), married Sadie Clinton. Frank had five children: Stella, who married Norman Magree; Frank junior, who worked as an underwater salvage specialist, Madge; Betty; and Patrick, who managed the stonemason firm of Pike and Martin. Frank’s family apparently lived in or close to the Clark “colony” surrounding York Avenue: his family were also regular attendees at George’s Sunday services at home! 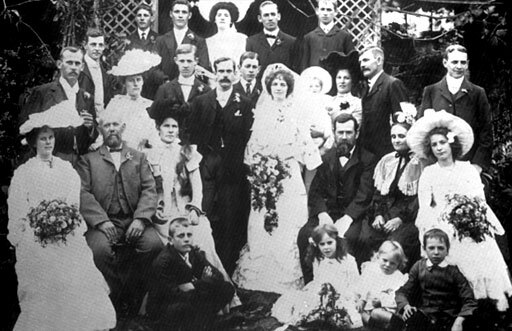 Leonard James married Kathleen Emily Mary McKeown, in Durban, on September 15,1920. Four children were born of that marriage: Leonard Terence (born July 28, 1921), Natalie Holly (born December 25, 1922), Barry James (born August 13, 1924), and Rodney Stephen (born August 17, 1926). The eldest daughter, Irene May Pilling (born May 27, 1915) was Kathleen’s daughter from her first marriage: Irene adopted the family name Clark. Leonard first lived in York Avenue, opposite the Eales family, but later moved to 68 Riley Road in Overport, and then to the Haraldene Road home. Irene bought this home out of Leonard’s estate, and occupied it until her death on January 22, 1988. Barry thereupon bought the home out of her estate, and it is now occupied by his son Michael. After returning from active service in World War I, Leonard joined with Sydney (son of Jack Clark – see Chapter 8) in a wool hide and skin business trading as Clark & Co. The business prospered and was ultimately incorporated into the Wool Brokers Federation, with big stores on Umbilo Road: it today trades as Congella Federation, and is property orientated. Len junior enlisted with the Natal Mounted Rifles at the outbreak of World War Two in 1939, and saw service in East Africa, Abyssinia, the Western Desert and Italy. He was wounded at the Battle of El Alamein and Mentioned in Despatches. Shortly after the war ended, Len joined Home Journal Press (Pty) Ltd., which he subsequently purchased, in 1966. 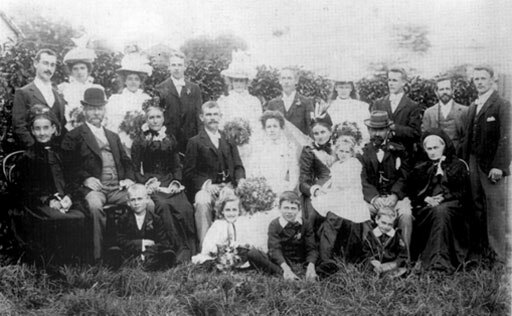 He married Estelle Joy Corbishley – a descendant of a well known old established Durban family – whose grandparents donated the initial property and buildings for the Ethelbert Children’s Home. Both Joy and Len have been active choir members of various churches: Joy is a noted soprano who has won many awards at Eisteddfods, and she was in the SABC choir for many years when it was under the baton of the late Leonard Pearce. Len is now semi-retired, and his sons in law Rik Kort and Brendan Blake and son Gordon Clark are involved in the Home Journal Press. Barry Clark is an architect, probably the only “authentic” Clark to still live in Clark Road,10 and has served as a Durban City Councillor. He was a bomber pilot in World War Two, and has long been active in the South African Air Force Association – of which he is at present an Honorary Vice – President. Barry is married to Dr. Phillipa Clark, former Deputy Head of the Department of Psychology at the University of Natal, and an active and effective advocate against sexism and racism. The youngest of George and Hannah’s children was Muriel Alice, who married Wilfred Bydawell. She was a talented singer who, from photographic evidence of her constant close proximity to her father, and the way in which she was provided for in her father’s will, appears to have been the apple of his eye. Muriel’s singing career led to her performing in England. She lived at the corner of Bulwer Road and York Avenue, in the house built on the site described earlier. Muriel and Wilfred (apparently known as “Billy”) had one son, George. George Clark senior died on August 16, 1920, and Hannah Clark on April 9, 1925. Muriel Alice Clark); George Clark (sr.); Great G.M. Mary Marcus. Marion Clark (nee McConnell); Tom Clark with Edith Clark; Emily Clark. 1 Note entitled “George and Mary Marcus”, found in the Local History Museum (Durban) or the Killie Campbell Museum. This note was recorded by May Eales, of 293 Clark Road, a grand-daughter, and is dated June 2, 1949. 3 Id. Marcus certainly worked together with Morewood in establishing the sugar industry in Natal. See Robert F. Osborn, Valiant Harvest, The Founding of The South African Sugar Industry; at pgs. 27 and 32. May Eales cites page 1-41 of the “Immigrants Guide”, by Dr. Robt. James, published in 1867, as authority for her claim. 4 Undated note entitled “Mrs. Geo. Clark (nee Marcus)”, apparently recorded by May Eates, and located in the Killie Campbell Museum. 5 George Clark estate file, Natal Archives. 7 May Eales note on Mrs. Geo. Clark. 8 For the benefit of those born after decimalization of the currency in the early 1960’s, a “tickey” was a small silver coin (about the size of the present five cent coin) with a face value of threepence. 9 D.H.S. Old Boys Magazine, “The Bulletin”, of June/July 1980 - Obituary on page 16. 10 Though not in the old Clark “colony”. His home, at 417 Clark Road, was built in 1889 by George Cato, the first Mayor of Durban.